Smiling in Second Grade: Five for Friday! It's Five for Friday time! Okay, okay. It's been a busy week. It's Five for Saturday time! 1. We started geometry this week. Geometry in second grade is so much fun! Geometry in high school? Well that was a different story. We started the week by making robots with our pattern block templates. 2. In Word Study we've been looking at the different ways to spell the same vowel sounds. For example, long -a can be spelled -ay, -a, -eigh, etc. It's a tricky language we have! At the end of the unit, we played a Guess Who type of game. I'll share more on that later! 3. This week we also started our science kits! The kids have been itching to do experiments since the box was delivered to our door. Our kit is all about Matter. We started by discussing the different properties of solid objects. We got to play with some objects, what's better than that? 4. Last weekend, my husband and I went out to dinner with friends. For dessert, we got S'mores! How cool is that?? They even brought flames to our table so we could roast the marshmallows! 5. Last night was the Spring Dance at our school. So fun! It was so cute to see all the little kids dressed up with their parents. The PTF also did a great job decorating and setting up the high school gym. We are starting Geometry this week, too. I can't wait to hear about the Guess Who game. S'mores sound delicious. That looked like a lot of fun! Hi Sara! 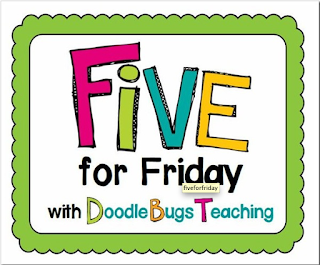 I just linked up with the 5 for Friday and found your blog! How stinkin cute is this! A person could visit all day here! Loved reading about your week and happy to be a new follower! I laughed when I saw your s'mores!! When my husband and I were registering for our wedding... I saw a s'mores maker and fell in love. My husband didn't see my "need" for it! :o) Anyway, I was telling some co-workers the story and at my school bridal shower I received THREE s'mores makers as gifts!! LOL!